A tulsi plant outside an Indian home in the Hindu community is a commonplace sight. Worshipped as the representation of Tulsi, the consort of the God Vishnu, the plant is additionally hailed for its medicinal properties. Its scientific name is Ocimum tenuiflorum and it has a significant role to play in Ayurveda. It is closely related to basil (Ocimum basilicum), which is used as a culinary ingredient, but it is a shorter lived plant. 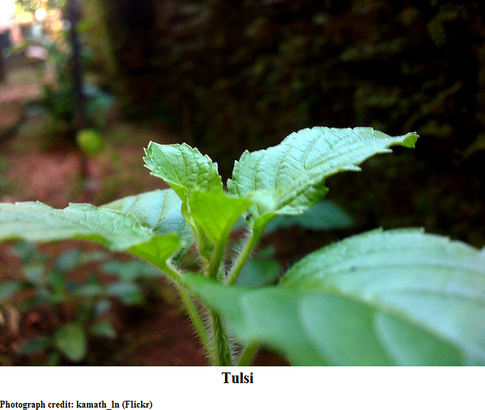 The oil of tulsi acts as a mosquito repellent. If the juice is applied on insect stings and bites, it has a soothing effect on the victim and heals the bites or stings quickly. Tulsi is used in relieving several respiratory ailments such as asthma, bronchitis, common cold, etc as it helps loosen catarrh and phlegm. One can boil the leaves and add honey and ginger to the water, and use this as an effective remedy. Water obtained after boiling tulsi leaves and cloves (add salt) can be taken to ease the effects of influenza. Tulsi is said to reduce fever in illnesses such as malaria and dengue. The antioxidants and essential oils in tulsi leaves are beneficial to the proper functioning of the pancreas and help lower blood sugar levels in diabetic patients. Eugenol in tulsi can control blood pressure levels and lower cholesterol. Since tulsi helps maintain normal levels of the stress hormone cortisol, those who are under mental duress will do well to chew a few leaves of tulsi every day. Tulsi brings down uric acid levels in the blood. It can dissolve kidney stones and produce the effect of painkillers to reduce pain in the kidneys. Tulsi has been found to be effective in fighting breast cancer and oral cancer. Using tulsi extracts one can be free of acne prone skin and hair fall. The juice of tulsi is said to treat skin conditions such as ringworm and leukoderma effectively. Its antifungal and antibacterial properties allow it to alleviate mouth ulcers and other infections of the mouth. Brushing your teeth with a powder of dry tulsi leaves will help get rid of halitosis and is beneficial in treating pyorrhoea and other dental problems. Ingredients: ½ cup of small prawns, 2 cups of thick coconut paste, 2 tsp of coriander seeds, ¼ tsp of tamarind powder, ¼ tsp of turmeric powder, 10-12 dried red chillies (optional), 1 onion, 1 star fruit or 2-3 pieces of a raw mango, salt and sugar. Preparation: Shell the prawns. Prepare a paste of coconut, coriander seeds, tamarind powder, half an onion and chillies. Chop the other half of the onion finely and sauté it in oil. Then add the above mixture with the prawns, star fruit or mango pieces and salt and sugar for taste, and cook it for five minutes. Ingredients: ¼ Kg of mussels, 100 gm of coriander, 20-25 flakes of garlic, 2 inch piece of ginger, ¼ tsp of turmeric powder, 6 chillies, 1 tsp of lime or lemon juice, 150 gm of semolina or bread crumbs, salt and sugar. Preparation: Clean the mussels well and apply salt and allow to rest. Remove the water that will emerge from the mussels. Prepare a paste of coriander, garlic, ginger, turmeric powder, chillies and lime or lemon juice (add salt and sugar according to your taste). Mix the paste and the mussels and then roll mussels in bread crumbs or semolina and fry them in any cooking oil. Memory improvement: Add a powder consisting of brahmi (centella asiatica), shankhapushpi (convolvulus microphyllus) and hirda (Terminalia chebula) to a cup of milk. Add sugar to taste. Stir well and drink daily at night before going to bed. Adjust dose to suit age.